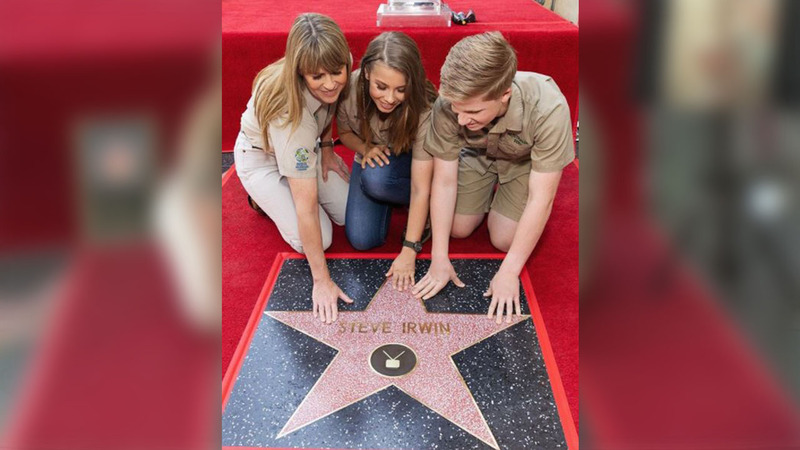 LOS ANGELES, CA -- Twelve years after his sudden death, "Crocodile Hunter" Steve Irwin received a star on Hollywood's Walk of Fame Thursday. Irwin died in 2006 after being struck in the heart by a stingray barb. He was 44. The icon animal conservationist's mission has been carried on at the Australia Zoo by his widow, Terri Irwin, and his two children, Bindi and Robert Irwin. The whole family was on hand and very excited about the honor after having found out he was getting a posthumous star last summer. During the ceremony, they accepted the award in his memory, GMA reports. "I have been so privileged to have had the biggest adventure with Steve," Terri said. "Every single day was like being in the middle of a cyclone. We never knew where we were going to go or what we were going to do. ... I learned from Steve that everyone just needs to say yes to stuff." She also reminisced about the trips they took and adventures they had. Bindi, who has captured the hearts of social media users, got very emotional while remembering her late father. "We try to continue dad's legacy each and every day," she said, before breaking down. "I'm gonna get a little bit emotional, it's such a special day ... I never in my wildest dreams thought that this would become reality, it's such an honor as a family to continue in his footsteps." "He was the best and most incredible conservationist on the planet, but also the best dad," Robert added.